Welcome to Critic's Notebook, a quick car review consisting of impressions and marginalia regarding whatever The Drive writers happen to be driving. Today's edition: the 2018 BMW M5. Quick Take: The car that helped define the sport sedan decades ago has grown in proportions and power over the years, to the point where it now combines full-size luxury sedan comfort and amenities and supercar-level performance. See all BMW M5 specs and pricing information here. Christ, is this thing fast. Sure, you expect that climbing into an M5, but even your expectations wind up being thrown against the rear window the first time you give this Bimmer the fully welly. The bones of this engine may be traceable back to the first-gen X6 of a decade back, but the Bavarian motor given the uninspiring designation of S63B44T4 is in no need of replacing anytime soon. Amazingly, it feels more potent than BMW's claimed 600 horses—something born out by at least one independent dyno test, which found the car was pushing out 625 hp and 603 lb-ft at the wheels—delivering an explosive punch of acceleration when prodded anywhere in the rev range, from where the torque curve plateaus at 1,800 rpm to the top of the horsepower peak at 6,600. It's enough to make you wonder why Bimmer bothered adding any power to the even-feistier M5 Competition; the last thing this car needs is any more ponies. Restrain your right foot, though, and the newest M5 does the same damn fine impression of a 7 Series as any well-optioned 5er. The cockpit is commodious, able to seat four tall adults in bountiful comfort. In Comfort mode, ZF's delightful eight-speed automatic slips from cog to cog like a warm ice cream scoop through Chunky Monkey. The latest version of iDrive is fast and intuitive enough to make up for all the sins of its fathers, and tasty tech add-ons like the elegant, colorful head-up display and the gesture-based infotainment controls (a sure-fire way to impress a date, in my experience) clearly mark this car as on the cutting edge of autodom. BMW designs may have seen their ups and downs over the years, but the carmaker has always pulled through when it comes time to sketch out an M5. 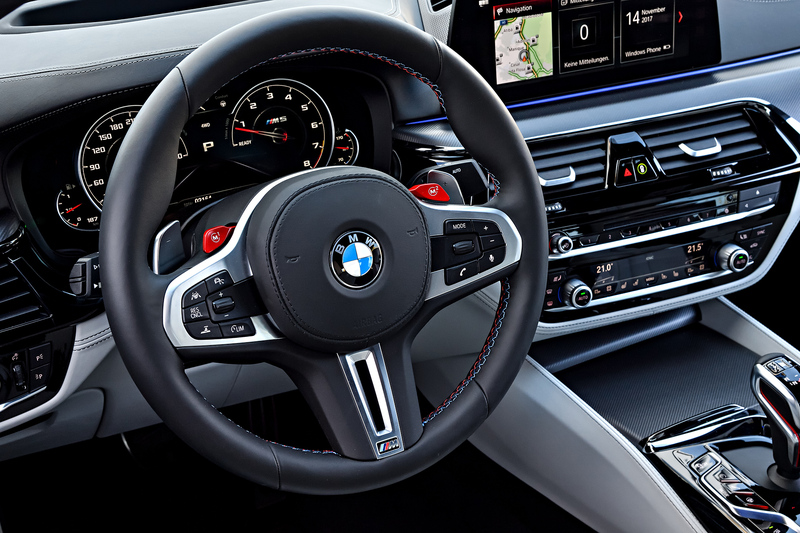 The latest version is no exception; the M design cues add aggression, even a touch of arrogance to the stately 5 Series exterior, with a sharp jawline and bulging quad tailpipes surrounded by punched-out sheetmetal. Like all M cars nowadays, the M5 offers a Cracker Barrel buffet of settings for its various driving systems; steering, throttle response, suspension, transmission, all-wheel-drive system, and stability control all get their own multi-mode adjustments. And unlike most of its competitors, the M5 doesn't bundle them together into preset modes; you have to individually adjust them, based on what you're looking for. There are two M-mode memory buttons on the steering wheel you can use to bookmark your preferred settings, but it means a lot of forethought and trial and error. Should I use one for the track, and one for the street? One for city driving, and one for highway? One for going fast, one for commuting? It’s just too wired-up, too tense, too hard-edged for city life when dialed up to attack mode. Cranked all the way up, it reminds me of a Ferrari or Lamborghini’s urgency and immediacy. Which would be fun on a track; it's much less so on Red Hook’s streets. In Sport mode, the transmission feels slam-bang; in Sport Plus, the steering too artificially heavy. But loosen the reins, and it feels almost too lethargic for city life. Comfort weights the steering rack just right—but adds in too much slack, too much play for New York City's vigilance-requiring traffic. The laziest setting for the throttle requires more of a poke than you'd expect in a 600-hp car to cut through traffic. Good Lord, those ceramic brakes are grabby. Modulating them smoothly requires a surgeon’s delicacy, especially at low speeds and around town. As editor Mike Guy put it, it feels like the pedal gives you four centimeters of travel before you hit ABS. The setup would be great for a track car; on a luxury sedan, however, it makes it nearly undrivable. Manual mode offers three different shift speeds, but the gears are so short and it accelerates so quickly, manual mode feels silly in all of them. Shift at 3,000 rpm, as I usually like to, and you’re in fifth gear by 40 mph. "On paper, the new M5 might suggest a softer, more-isolated experience: Electric-assisted steering vs. hydraulic. A torque-converter automatic versus the old dual-clutch unit. AWD instead of rear-drive. But the truth turns out to be the opposite. The M5 is faster, friskier and more engaging than its icy-souled predecessor." "The new, Einstein-level M xDrive adds about 130 pounds to the M5, yet it’s worth every ounce to get those 600 horses to the pavement. Old-school types can still dial up a 2WD mode that decouples front wheels entirely, for the kind of lurid drifts and barbaric burnouts not usually associated with a BMW." 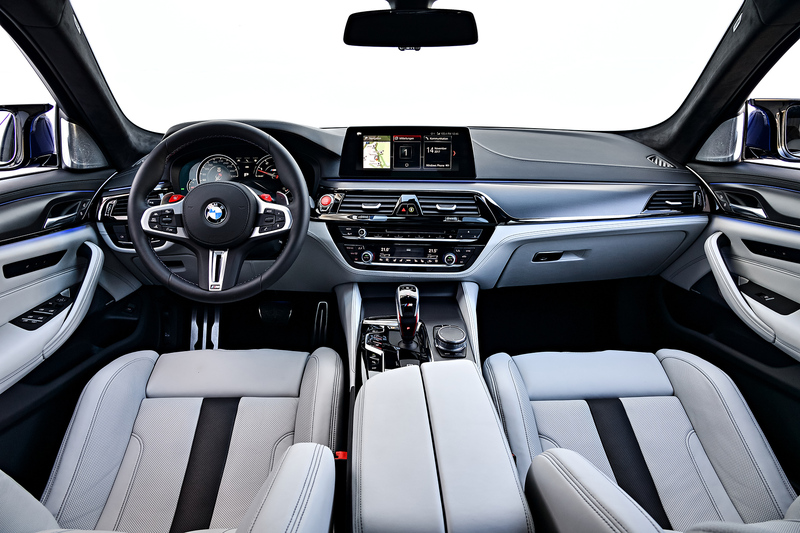 "The Bimmer’s head-up display is the new benchmark in luxury cars, with crisply rendered presentations and a 75-percent larger viewing area." "The M5 also looks and feels more special inside, more worthy of a $103,595 base price that’s a significant $8,500 higher than last year’s model. 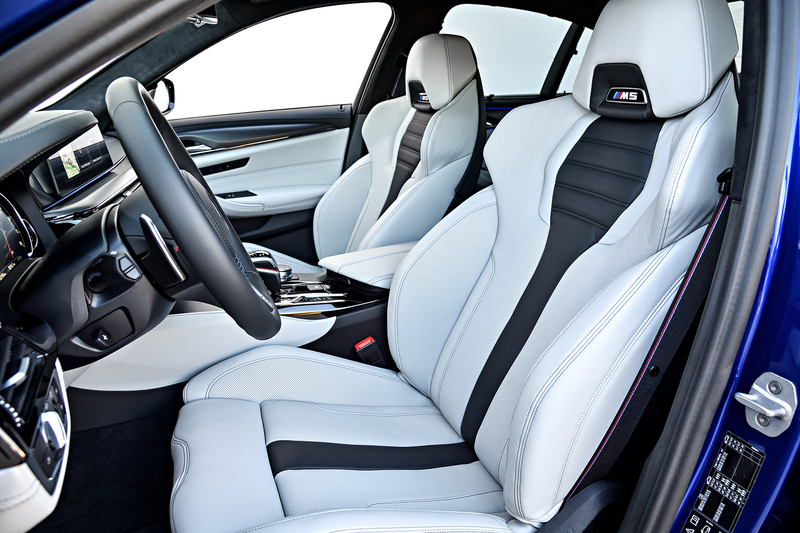 Dramatically winged sport seats, especially in off-white leather with black inserts, bring serious visual pop." Trying to suss out the M5's value depends largely on how your view it. Look at it as a replacement for both a large, all-weather luxury sedan like a 540i xDrive and an entry-level supercar like the McLaren 570S or Audi R8, and even the almost-$130,000 as-tested price of this blue beauty seems like the sort of bargain Roger Daltrey would sing about. Stack it up against the likes of a Porsche Panamera Turbo, which runs a tick or two behind the M5 in most quantitative metrics in spite of a base price $47,000 higher, and it still seems quite the deal. But viewed as a way to extract both as much driving pleasure and usability from a single vehicle as possible, the M5's bright status seems to dim a tad. After all, if that's the aim—and that would seem to be the aim of the category, no?—an E63 wagon orPanamera Turbo Sport Turismo offer even more usability, with cargo bays that rival a C-130's by comparison. Alternately, the role of one-car-for-all-tasks might be better performed by—dare I say it—a high-performance crossover, such as the Alfa Romeo Stelvio Quadrifoglio or Porsche Cayenne Turbo. BMW's own X5 M may not be able to snap from naught to 60 quite as fast or corner quite as well, but it can fit 17 more cubic feet of whatever behind the second row than this M5—and it's better suited to the bashed-up streets of New York than this high-strung sedan. Every sport sedan is defined by its dualities to some degree, but the best ones manage to seamlessly blend their luxury and performance sides together. In the case of the F90-generation M5, however the two personalities of the car almost seem to be dueling, like Two-Face and Harvey Dent. Half the car wants to be a supercar, the other half wants to be a limousine, and both facets are too stubborn to compromise—when that's exactly what a great sport sedan needs to be about. It would be less of an issue if it was far and above better than everything else in one category or another, but the segment is packed with capable contenders. Explosively quick as the M5 is off the line, Tesla's Model S P100D does straight-line speed better. The CTS-V doesn’t put the power down as well thanks to its rear-wheel-drive layout, and it’s far less appealing inside—but it’s far more fun to drive, with lively, natural steering and suspension. And it's the M5's arch-rival, the AMG E63, that seems to best represent a modern interpretation of the do-it-all-smoothly-and-well ethos of the E39 M5 that defined the speedy four-door concept for a generation. The M5 is a technical marvel, but compared to some of its ancestors and competitors, it just feels a little Janus-faced.